It all depends on what you want. Target, defense, or hunting? I use a rifle for hunting, but lots of guys use handguns. They are probably better shots than I am. I have used Bullseye, 2400, Unique, Clays and 4756 successfully in .357 Magnum and .38 Special loads, and Unique and 2400 in cast bullet rifle loads. It has shaken out to Unique or 2400 for the velocity levels I use most, usually what my brother in law calls hot.38-mild magnum velocities. Which I think are plenty for almost any purpose, and are pleasant to shoot. Clays is a good, inexpensive,(per round) utility powder I use for plinkers and the like. There is no reason I don't like it as well as Unique or 2400...probably just what I was raised with... I just don't. The two old-timers have been around since forever, and millions of rounds have been safely loaded with them. (And a few of the other sort, too.) It is hard to double charge a case with either...it would be noticeable, given reasonable inspection practices. Unique covers the range of cast and jacketed bullets to any reasonable velocity, and 2400 is there for higher velocities because it is a good powder, and just because one of my heroes, Skeeter Skelton, liked it and loaded it so much. There are at least a dozen good powders, but to me, the most versatile seem to be Unique and 2400. W-231 works good with non-reduced loads and standard weight (or better) for caliber bullets. 700X is good for reduced loads/light plated bullets for plinking. Super clean. Watch for low volumes/too much case free-space. I am getting ready to order more powder for my 357 and 44mag handguns, I currently use bullseye, unique, imr4227. I was at alliant's web site and was pretty impressed with their loads with Alliant 300mp powder for the above calibers. Has anyone tried this powder? I just downloaded alliants reloading guide and here's an example. And its the same with the 44mag. These are very impressive increases, since I have the day off, I'm heading to the gun shop and see if I can get some. ....WOW...300mp is pretty impressive!I'll still use unique for my auto's tho. Well I manage to get 2lbs of 300mp, the owner of the shop to me this powder is in big demand and the people that bought it says it was excellent. So now off to reload some 357 and 44 shells for tomorrow's trip to the range. I love it...I hope, Omini, that you can give us some "real" data. Like the length of the barrel. And the use of a chronogragh. For all we know Alliant used a 10" test barrel...Instead of a "real" weapon. You know...4" or maybe a 6". And of course, the propriator of the store is going to say it's the "greatest thing on earth". He wants to sell the stuff. I hate "wet towels". Don't you? I just got done loading at below max averages for the 44mag. I loaded 240gr speer behind 24gr which is less then max and I loaded 300gr nosler behind 21grs of powder. That said, I will be at the range tomorrow with my chrony F1 and will post results tomorrow night. This is what I will be shooting tomorrow morning. oops, forgot, it's a ruger super redhawk 9 1/2"
temp 35 F, no wind. Each load consists of 10 rounds, all starting loads were reduced 10% from max loads. OAL is from alliants loading book. All loads uncrimped. Chrony was placed 10 feet from muzzle. imr 4227, this powder sounds way lower in pitch. When shooting the 240 and 300gr Max loads, recoil is very stiff. No problems with any of the cases or primers after firing. Barrel was cleaned before going to range, No unburnt powder in barrel after firing any load. Barrel was not cleaned until I got home. powder might be an easier powder to ignite. O K...Now I'm impressed and curious. I wonder how it stacks up in a 4" barrel? yep, that makes 2 of us. I have no idea why this powder wasn't given a little more advertising but from looking at different gun sites it seems to be a big hit. Next weekend I will load for my other (357mag) and post results. 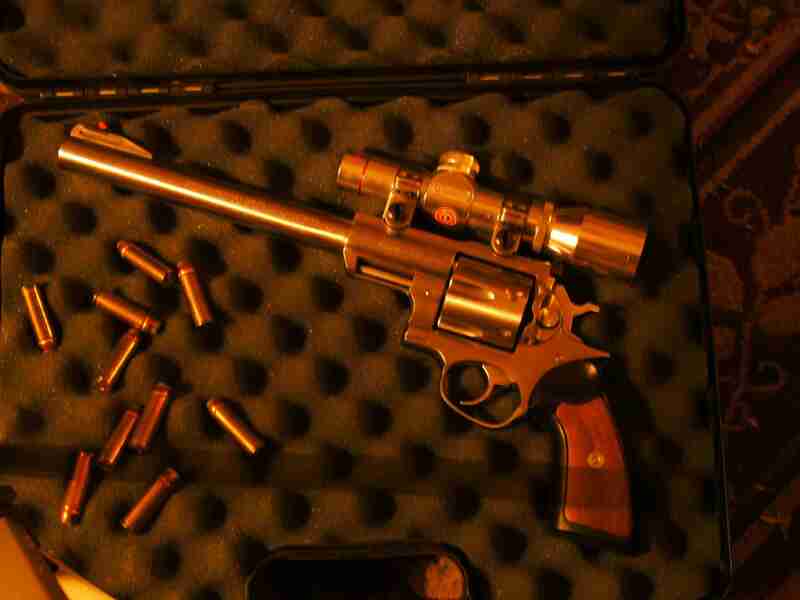 The 357 is an Astra 6" handgun that I brought in the middle 80"s.
Also read about that this powder is a refine of smg powder from Olin? from what I read about it, it was produced for law enforcement many years ago. Does any one remember this? Looks like they are finally marketing a true magnum powder !! !